Holds up to 25 pounds of seed. Seed Chart for accurate seed broadcasting. Adjustable shoulder strap. 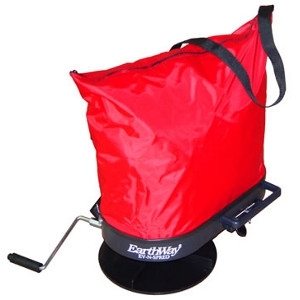 Earthway’s #1 selling over-the-shoulder broadcast spreader is made with top-qrade water resistant material. This spreader features a seed flow rate adjustment that allows you to accurately spread seeds of all sizes. The gears are protected from the elements which ensures your spreader will last for years. The easy to use on-off control switch makes seeding accurate and easy.